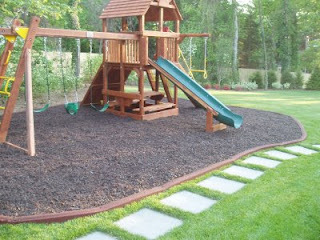 Rubber mulch : yay or nay? At Home Depot I found out they are now selling bagged rubber mulch (by Vigoro) that looks much like the real thing. It's made from 100% recycled tires, but it's dyed to look like red or brown wood mulch. There's some pros and cons to rubber mulch, but it basically boils down to this: it will take a long, long time to break down. That's a great thing if you are using it on a walkway or playground and have no desire to replace the mulch all the time. That's not a great thing if you want your mulching material to break down over time and add new organic material to your soil. For playground use, I think it's a pretty good look and doesn't leave much mess. I hate that most local playgrounds are filled with sand, since little Nelumbo Jr. manages to get really dirty. She also thinks it's fun to pour sand on my shoes. I think rubber is a much better alternative. It's much easier to clean off my sneakers, anyway.